Located near the city of Cork in Southern Ireland, the Blarney Castle is one of the most famous castles in Ireland. Built by one of Ireland’s most powerful and influential chieftans, Cormac McCarthy roughly 600 years ago, the castle attracts droves of visitors to this day. Much of that has to do with the legendary Blarney Stone, which is said to give you the gift of eloquence upon kissing it. Though the Blarney Stone attracts its fair share of visitors, the allure of the castle goes well beyond this famous stone. The castle itself, and the gardens that surround the castle, are some of the most beautiful in Ireland. The Blarney Castle and Gardens is one of the last remaining estate villages remaining in Ireland as well, which makes it a key piece of history to hold on to and treasure. The Blarney Castle is located in the South of Ireland near the city of Cork. From the city of Cork, the castle is just a 15 minute drive via the N20. If you are coming from Dublin, you will want to take the M7, the M8, and then the N20 to get to the Blarney Castle. The drive will take you roughly three and a half hours. 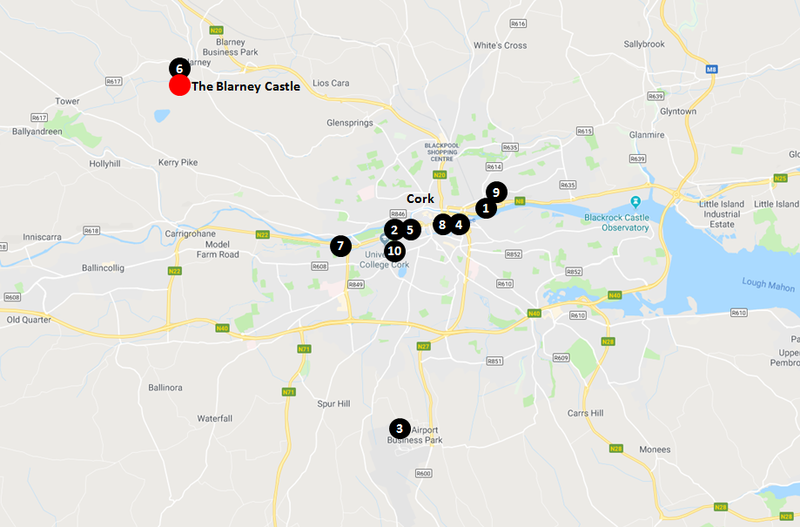 If you are heading to the Blarney Castle from Galway in the West, the castle is roughly two and a half hours away via the M18 and N20. From the city of Cork, please use the following directions to get to the Blarney Castle. It is hard to really plan around the weather in Ireland, as most of the year the temperature is pretty consistent and the weather is typically wet. However, some parts of the year are typically a bit warmer and dryer than others, so having this information to use in your planning is always good. I have included the average monthly temperature and precipitation for each month of the year for the city of Cork below. This should assist you in determining when the right time to plan your visit will be. The average high and low temperature for Cork, much like the rest of Ireland, doesn’t typically get too high or too low throughout the year. The months of June thru September are your warmest months, with average highs in the 60’s. During the months of January and February, the average lows drop down into the 30’s, but it typically doesn’t get much colder than that. It wouldn’t be Ireland if there wasn’t a lot of rain, and the city of Cork is no different. In some months, the city sees over five inches of rain. If you want to maximize your chances of having dry weather, I would shoot for the months of April thru July, where the average amount of rainfall is closer to three inches than five. When visiting the Blarney Castle, your best bet is to stay in the nearby town of Cork. To assist you in locating accommodations in Cork, I have included a list of favorably rated hotels and other accommodations at various price points for you to review below. If you are looking to get a tour of Blarney Castle and the Gardens, I would plan to spend at least 2-3 hours exploring. Ideally, the Blarney Castle should be considered a half-day affair as the lines can be a little long at times. To assist you in your planning, I have included information below on the hours of operation and fees (also shown in the image above). For more detailed information, check out the Plan Your Visit guide on the official Blarney Castle website. Without a doubt, one of the biggest draws to the Blarney Castle is the Blarney Stone. For over two centuries, people from all over the world have traveled to the Blarney Castle to kiss this mystifying stone. It is said that kissing the Blarney Stone will give you the gift of eloquence, so it became a popular tourist attraction. Back in the day, you used to have to be held upside down by your ankles to reach, and kiss, the Blarney Stone. Today, the process is much easier. You simply lay down, with someone holding, and reach your head down to kiss the stone. In the picture below (which was taken looking up) you can see someone kissing the stone. The Blarney Stone, and the tradition of kissing it, has a very interesting history. I strongly suggest that you read up on it before you make your visit. To assist you in planning your trip to see Blarney Castle, I have included a number of helpful resources below. Along with this guide, these resources should provide you with all of the information you need to make your trip a success. The Blarney Castle is an amazing piece of history. It was a lot of fun to visit, and even more fun to photograph. Below are just some of the pictures that I took while visiting the Blarney Castle in Ireland.